Following the end of World War II, Walt Disney attempted to rebuild his studio from the stalemate it had found itself in. However, his drive in the world of animation wasn’t quite what it once was. And as such, Walt soon found himself being side-tracked into other realms, such as television, and a pet-project that became known as: Disneyland. Also during this time, was his push to bring live-action filmmaking to the studio. During the 1950’s, the studio had success with film adaptations such as Treasure Island, and 20,000 Leagues Under the Sea. However, one area that the studio had conquered well within animation, had yet to properly be done on-screen by the studio: a live-action musical. Word was, one property that Walt was eager to get off the ground, was one of the books in the Wizard of Oz series, titled Rainbow Road to Oz. Concepts, costumes, and what could be considered a preview of the film, showed on the Disneyland television series in 1957, with performances by several of the studio’s Mouseketeers (including fan-favorite, Annette Funicello). However, the project was eventually shelved, with numerous theories abounding as to the cause. Instead, the first live-action musical the studio would undertake, would be released 4 years later: an adaptation of the operetta: Babes in Toyland. Set up as an elaborate stage musical that the audience seems to float into, we join Mother Goose (Mary McCarty) and her pet goose Sylvester, in Mother Goose Village. The citizenry is all based around characters from popular nursery rhymes, with two of them to be wed soon. They are Mary (quite) Contrary (Annette Funicello) and Tom Piper (aka the piper’s son, played by Tommy Sands). One person who is not happy regarding the nuptials, is the town’s landlord Barnaby (Ray Bolger), who schemes to separate the two and marry Mary, who is (through unknown means) meant to inherit money upon her marriage. Over the course of 1 1/2 hours, the film takes the viewer from the village, to The Forest of No Return, and finally, the Toyland of the title, presided over by the Toymaker (Ed Wynn). Looking over the film, one can’t help but feels there’s some left-over residue from not only Rainbow Road, but also some connections to the MGM Wizard of Oz film. With almost all of the film’s sequences shot within the soundstages of the Disney Studios, it has the spectacle of an old-style musical in its setups. And let’s not forget one of the most notable connections: Ray Bolger, who played the role of the Scarecrow in the MGM Oz film. One would assume that given its content, and being a Disney production, the film would be a homerun. Instead, it almost feels like another studio’s production trying to copy the Disney style. So, where does Babes in Toyland stray off the path? One could most likely claim this in the way of the story and characters. Sadly, most of the characters don’t really have much in the way of development. Many seem to be just as simple as their name implies. Because they are simple characters in nursery rhymes, the filmmakers may have felt they could have gotten away with this, but it keeps many of the characters from sticking in our minds years later. Annette is still a charming young woman in the production, but she seems little more than that. Her dark-brown hair has been lightened, and she seems little more than a wide-eyed innocent at times. In fact, don’t be surprised if she seems a little like Judy Garland’s Dorothy from Oz. Tommy Sands serves moreso as her co-star, but offers very little in the way of character moments that make him memorable. His one big chance to shine, is during the battle scene at the end. In a production such as this, it seems that the more memorable cast are the co-stars. Barnaby’s devious machinations make him all the more memorable, with Bolger’s fancy footwork and voice sticking in our ears, notably in how he pitches his voice across several octaves. It is also a little funny that with his slicked-back hair and mustache, he almost looks like Walt Disney from the 1930’s. His henchmen Gonzorgo (Henry Calvin) and Rodrigo (Gene Sheldon) serve as the typical bumbling henchmen, with Sheldon’s Rodrigo seeming to be channeling the characters of Dopey and Gideon from Snow White, and Pinocchio. His baggy clothes and demeanor seem very much like Dopey, though his constant attempts to double-cross and bash in someone’s head with a wooden mallet seem very much like Gideon. Is it me, or was there some stereotype of the time about quiet persons being liabilities that could lead to murder or death? Near the last third of the film, we are introduced to The Toymaker and his assistant, Grumio (Tommy Kirk). Wynn’s portrayal of the Toymaker is one of the better moments, with the actor giving a kooky twist to a man who isn’t quite as smart as he thinks. Kirk’s portrayal as the eager-to-please assistant has some decent moments as well. Musically, the film takes the songs from the operetta, and either tweaks them, or creates whole new pieces. In this day and age the larger choral numbers and love ballads seem a little hokey to modern day ears. If one has a good ear, one can hear similar tones to other Disney songs. For example, the ballad Just A Whisper Away, has some similar melodies, as the song Love from the animated Robin Hood (both of which were written by the same songwriter, George Bruns). Also of note, is quite a number of physical effects throughout the film. Sylvester is an intriguing puppet manipulated by Mary McCarty, and in one sequence, several children encounter talking trees. The tree designs are almost like animated figures brought to life, even if their bases are rather flimsy. It feels like that may be the biggest fault of the film: a lot of what we’re seeing, we’ve seen done better in some of the animated features. One notable scene is where Mary sings with a chorus of multi-colored selves, which is a little similar to the “Sing Sweet Nightingale” sequence from the animated Cinderella. Though the highlight of the film’s craftsmanship comes during a sequence where Tom rallies a number of toy soldiers against Barnaby. The stop-motion in the sequence was surely amplified in the minds of hundreds of children, given the pomp and circumstance of the moment. Released in December of 1961, it definitely feels like the film was aimed to become a Holiday “classic.” Heck, several of the toys within the film became some of the first to be shown on screen, and then make their way to toy shelves that Holiday season. An episode of the Disneyland TV show aired around the same time as the film’s release, with Walt Disney and Annette guiding their television audience around the film sets, and to the big wrap party. The special is another great little behind-the-scenes deal, showing everything from sets being disassembled, to the bank of makeup artists preparing dancers for the big gypsy dance number. The film also became one of the first to be publicized within the Disneyland theme park. After production, the Mother Goose Village sets were moved into the Main Street Opera House, where visitors could walk amongst them. Also adding to it’s theme park legacy, are the numerous toy soldiers one sees during the Holiday parades at the parks, which are based on those from the film. In closing, one can’t help but feel that Babes in Toyland is a passable effort on behalf of the studio, but does not hold up well when viewed years later. In a positive light, one can look at it as a stepping stone to the studio’s most famous live-action musical, Mary Poppins, which debuted 3 years later. When I think back over the dozen or so times I’ve been to Disneyland in my life, I realize that much of my indoctrination to the park, did not include a penchant for character interaction. 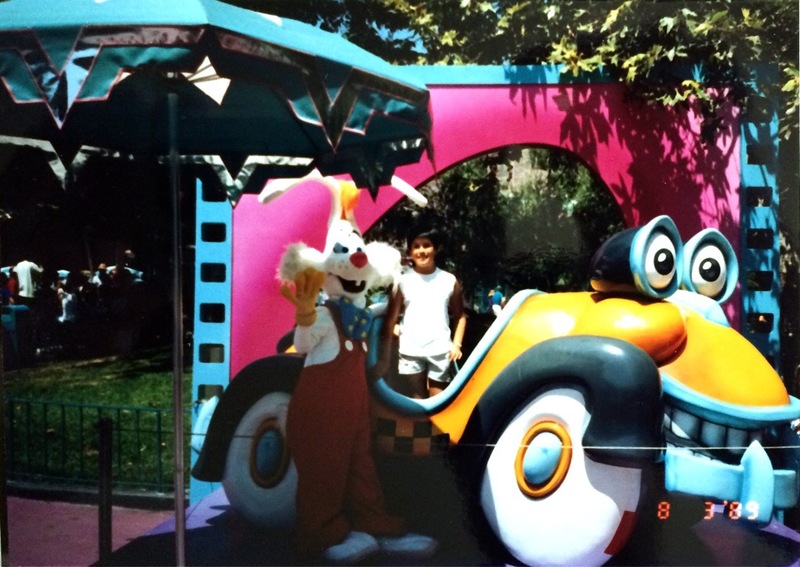 Sure, there are a few pictures of me with some characters, but our trips generally consisted of going on the rides, and seeing some of the shows and parades within the park(s). Frozen) debuted in the Fall of 2013. Pretty soon, the lines to meet the two sisters commanded wait times of over 5 hours, and have been that way for almost a year (and counting!). Naturally, talk of this explosion in lines for new character meet-and-greets, were on my mind when I decided to do the one for Big Hero 6, which would give attendees the chance to meet Hiro, and Baymax. What led me to eventually partake in this endeavor, was a Holiday visit to Disneyland with my Dad, along with my wondering on what Baymax’s skin texture was like. Much like the meet-and-greet for Wreck-It-Ralph, the one for Big Hero 6 was set up in the rear of the now-defunct Starcade location in Tomorrowland. The downside of this setup, is the line to see them, was pushed against the side of the wall, near the exit to Space Mountain, which became rather packed with humanity several times. 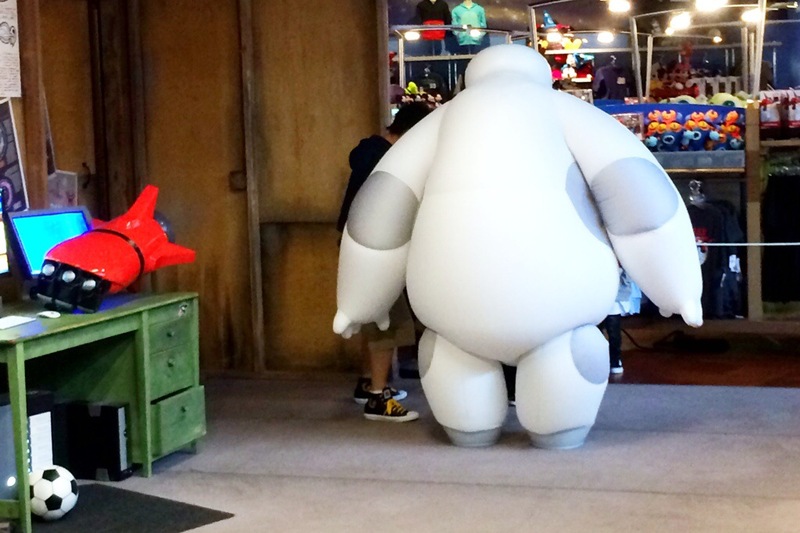 The day I visited, Hiro and Baymax were scheduled to appear between 10:30 am, through 5:00 pm. I arrived about 5-10 minutes after the scheduled start time, and was informed by a Cast Member that while Hiro would be there for the full event, Baymax’s time would be limited. The mention that I was at a point in the line that was considered a 1 1/2 hour wait point, almost made me drop out…but as with most of my logical thoughts, I decided to wait and see. A roped line snaked around inside part of the Starcade, while tape on the ground outside, informed people where to stand. 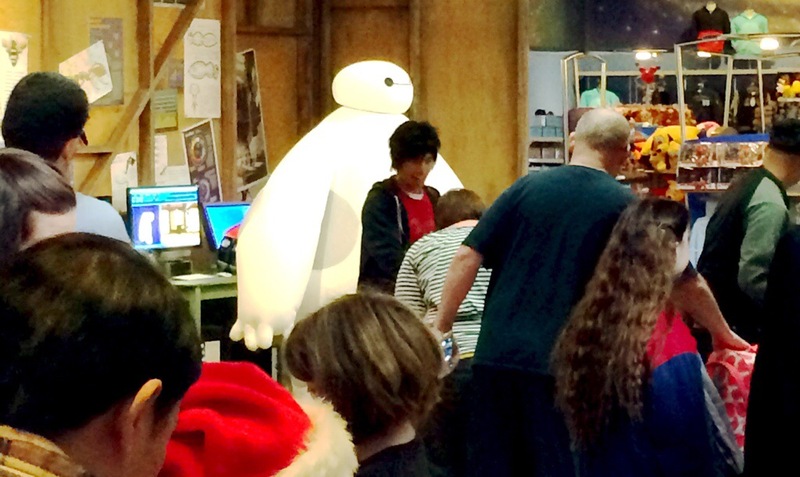 As the line moved on, many of us were happy to see that Baymax was indeed “online,” and appearing with Hiro. 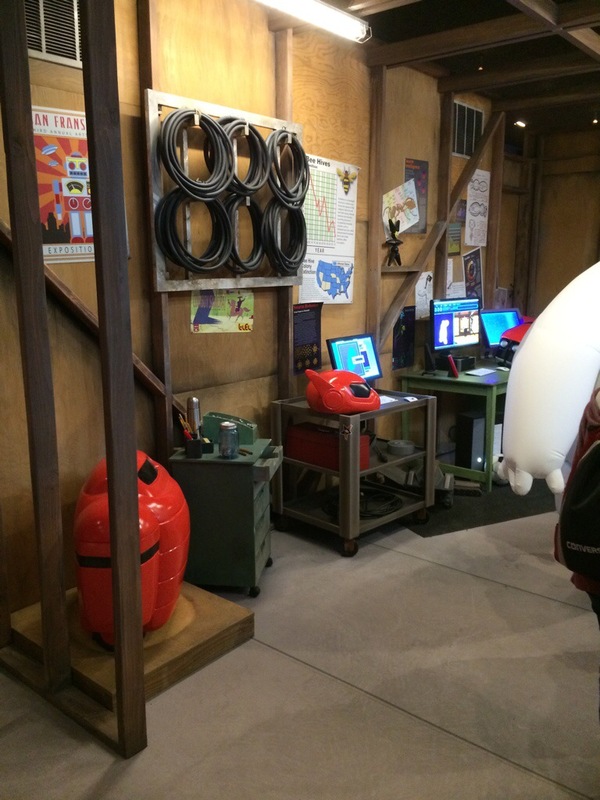 The meeting area was made up to resemble Hiro’s garage workshop, which included such touches as Baymax’s rocket-fist, and helmet sitting nearby. As well, Hiro’s computer monitors, showed parts of the martial arts programming that was added to Baymax’s information. During the course of the line wait (which ended up being an hour for me, instead of their 1 1/2 hour estimate), Baymax did leave the staging area a few times, to “recharge his batteries.” Luckily, his charging times were relatively brief, and he carefully sidled back out to continue his sessions with Hiro. When it finally came my turn to meet them, Hiro happily shook my hand, and introduced me to Baymax. Baymax eagerly extended an arm to hug me, and I was surprised that he was vinyl in texture (and just as huggable and soft!) his heart-dock was made of a plastic material, and it even looked like his head was plastic as well. And just like on the film, his eyes “blink”! We took several pictures, with my favorite one being me with an arm around Baymax, and Hiro giving me a fistbump (as seen above). 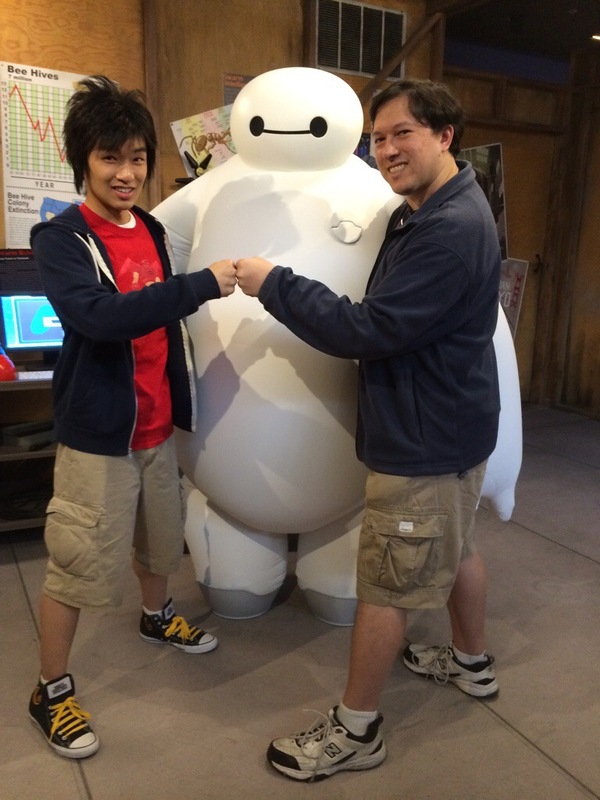 Hiro also suggested we do an arms-crossed picture in front of Baymax for a second pose. When it was time for me to leave, Hiro suggested we do a three-person fistbump. Baymax tried his best, but couldn’t roll his hand into a fist. Even so, I concluded it with a “badeladelaldelah,” and a polite nod to Baymax. I will admit that it was a pleasant experience, though I would strongly recommend getting there early as a precaution. I don’t know how much time Baymax generally is out, so an early visit would be a good insurance policy. I didn’t go back and see how long the line got after I left, but I bet it only got longer as the day wore on. The guy portraying Hiro was very energetic, and I saw him being as loose and boisterous as Hiro was in the film. Baymax’s movements were simple, with him even nodding his head a few times, along with sidling through the back doorway when he needed a recharge. I was hoping that maybe he would have had some audio sounds from the film, but even so, his presence was very comforting. One has to wonder if maybe some day, one of the kids who visited this meet-and-greet might actually make a helper robot, with his Disneyland memory in mind. Two decades after The Lion King pushed Walt Disney Feature Animation to new heights of popularity, the studio has found itself in a similar state in recent years. The studio’s last three films have proven to be a wonderful grab bag of choices, that shows the new culture at the studio is not willing to just do the same thing for each film. Wreck-it-Ralph sought to bring us into a world of video games in a way that many would probably never have attempted, and Frozen enveloped a sisterly tale amidst the rosemaling and historical architecture of the Norwegian culture. With the recent release of Big Hero 6, the studio found itself tackling a new frontier: a futuristic meld of two different cultures, AND a story that straddled the lines between Marvel Comics, and Disney‘s animation heritage. Much like The Art of Wreck-it-Ralph, this book reaches into Disney’s production staff to find its author. In this case, it is Jessica Julius, who has worked on several productions as a creative executive, and story production supervisor. Every making-of book contains several revelations I didn’t expect, and this one is no exception. Dealing in a world of superheroes and Tokyo-world aesthetics, the filmmakers reached out to both of these worlds, recruiting artists John Romita Jr (a comic artist from Marvel), and Tadahiro Uesugi, an artist from the land of the rising sun. The majority of of the book is taken up with designing the world and environments of the film’s main location: San Fransokyo. It was a given that the studio would send out a fact-finding crew to study both Tokyo and San Francisco. And out of that seemingly non-mixable combination, emerged quite an astonishing amalgamation. When it comes to character designs in the last few Chronicle Books releases, there are a select few artists that are mainly utilized. For this book, there are three key creative persons Julius focuses on: Jin Kim, Shiyoon Kim (no relation), and Lorelay Bove. Of the three, it is Jin Kim’s designs that I find myself gravitating towards the most. His line work has such an appealing look to it, that it looks like the character could start moving at any moment. Jin studied at the hand of animator Glen Keane, and it definitely shows in his work! It is notable to also see the evolution of several different characters as well. Baymax’s designs are simple and intriguing. Some show him with projected facial features, as well as samurai-influenced armor for his supersuit designs. I did chuckle at one image, in which Tadahiro did an early concept of Baymax, in a design that seemed influenced by the robots in Hayao Miyazaki’s Laputa: Castle in the Sky (as seen a few paragraphs below). There’s also a great breakdown image by artist Kevin Nelson, as to Baymax’s inner workings and design. While several pages are given to each member of the Big Hero 6 team, it was the development of Honey Lemon that is most intriguing. Her character evolution (some examples on the left) put me in mind of the development of Vanellope Von Schweetz: the concept kept going in one direction, but once the designers veered away, they came up with something that worked better. Honey’s early concepts were more of a girly-girl with a love of making things blow up, with everything from chibi-exploding devices, to outfits that one would find in Tokyo’s Harajuku district. The book also includes some abandoned concepts, including several where a giant monster attacks San Fransokyo, and numerous, additional (unused) villains. One that has a nice concept of kooky-uneasiness, is Mr Sparkles, who was based on some of the wackier personalities one sees on Japanese television. The final 12 pages of the book, are focused on the film’s cinematography, the studio’s new Hyperion Rendering platform, as well as a color script of the film. Color scripts have been a staple of PIXAR’s Art Of books, and they have been added to Disney’s Art Of books ever since The Art of Bolt in 2008. The set included here is rather intriguing, as the first few images, differ greatly from the actual opening of the film, making me wonder if the book may have gone to press while they were working on redoing the film’s opening. Much like my feelings regarding the film Big Hero 6, its Art of book feels like it doesn’t spend as much time on the characters beyond Hiro and Baymax. A couple characters I was hoping for a little more background on, were Aunt Cass (Hiro and Tadashi’s surrogate), and Alistair Krei (the head of tech-firm, Krei Industries). However, Aunt Cass is relegated to just two pages, and Krei is simply included in a small character lineup on page 145. As well, even some extra backstory on Hiro’s friends would have been most welcome. I think it’s because of Charles Solomon, that I’m a sucker for wanting to read plenty of paragraphs in an Art of book. While Solomon is a professor of animation history (and it shows in his writings), Julius is one who is moreso like a professor living amongst the subjects she is studying. Given the penchant for creativity in her world, she has chosen to let the achievements of the studio’s artists speak for themselves. Also keeping with the theme of the film being based on a comic book, much of the text is cut into small blurbs within exposition boxes. Even still, The book manages to carry on a wonderful tradition of giving us behind-the-scenes material and information, and if you’re interested in the concepts that lead to your favorite film(s), it’s definitely another to add to your collection. Within the last year, much of the world was thrown into shock by two major announcements. One was the (supposed) retiring of Studio Ghibli co-founder, Hayao Miyazaki. The other shock came when rumor spread that the famed studio he was a part of, would most likely shut down…however, still continue to do small animated projects for Miyazaki’s Ghibli Museum, located in Tokyo. However, buried within much of the back-and-forth of the internet, was the information that Ghibli‘s other co-founder, Isao Takahata, was releasing his first animated feature in over 14 years: The Tale of Princess Kaguya (Kaguyahime no monogatari). The film saw release in Japan during the Fall of 2013, and has just reached American shores, as of October, 2014, for a limited theatrical release. Of the directorial co-founders, Takahata is a less constant than Miyazaki. Since the founding of the studio in 1985, he has only made 5 feature films, including Kaguya. However, each time he releases a film, each one tends to be something special in its own right. Many highly praised his 1988 film Grave of the Fireflies, and one that I found myself appreciating very much ,was his 1991 release, Only Yesterday (of which I discussed in one of my postings here ). The story of Princess Kaguya, is based on the 10th century Japanese folktale, The Tale of the Bamboo Cutter. Though often changed over the centuries, the central storyline consists of a man who finds a baby within a bamboo stalk. As he and his wife were childless, they happily welcomed the little babe into their lives. As the man cut down more bamboo trees, he found riches within them, and took this as a sign that the girl was a Princess. And thus, decided that she must be raised as one. Takahata keeps much of the tale’s origin woven into his own tapestry on-screen, but does add his own embellishments to the story. He develops a number of characters within the tale, as well as adds his own. Kaguya herself is a wonderful character within the film, one who seems to thrive amid the country where she is born into, as well as in the company of a gang of village children who live near her parents’ hut. This is highly contrasted when she is to begin her life within the confined walls of the city, as her father wishes. At first, being in this new and exciting world is fun to the Princess, but she soon longs for the tranquility she grew up in. We see her find little pockets of happiness here and there, but there are times when she seems to quietly find herself wondering about things. In a weird way, Princess Kaguya almost reminded me of another famous humble beginnings film character. I speak of course, of Charles Foster Kane, from Orson Welles’ Citizen Kane. I can see some possibly taking issue with Kaguya’s placement in this society, but one must remember, it’s not a world that is being run through with modern-day popular-culture or the ‘girl-power’ of films like Brave or Frozen. It shows the sometimes sad realities and sometimes ridiculousness of some past traditions. There does come a moment where Kaguya balks at having her eyebrows plucked and blackening her teeth as part of a traditional dressing, but does so out of obligation to her parents. One gets the impression that she feels an obligation and a familial love towards them, but she is also wrestling with her inner emotions…and possibly, something else? With his 2000 release My Neighbors the Yamadas, Takahata sought to emulate a style similar to the comic strip the film was based on, giving that film a sketchy, watercolor feel. Kaguya almost captures the same feeling, but moreso in a historical context. Much of the style and characters take their cues from the Edo period of Japanese culture and art, though ‘simplified’ into a world of white backgrounds, watercolor, and pencil lines. Even still, the character of Kaguya is drawn differently from the others, looking more like a modern-day depiction of a woman than the Edo style of the 17th century. There’s a great contrast played up when she is put next to Lady Sagami, who is her tutor in how to properly be a Princess (as seen in the image below). Much like Miyazaki, Takahata seems to find a way to bring nature into his film, setting it up with a contrast at times to the modern city (of the time). Much like how the world seems to ‘breathe’ in natural beauty, Kaguya almost does the same. Her youth becomes one of fun memories, and her yearnings for return to that past world, keeps coming back to her, often in emotional ways that seemed to seep into the audience around me. Unlike most filmmakers, Takahata chooses a different composer for each of his films. This time, the honor falls to Jo Hisaishi, Miyazaki’s musical collaborator. And just as can be expected, Jo doesn’t disappoint. Traditional instruments are used in a number of pieces, but much like the Princess herself, Hisashi’s score finds itself hitting a number of emotional areas. In one scene, he utilizes strings with a striking of the piano keys, to get down a major moment for the Princess. And in an interesting contrast, a celebration theme is almost cause for the opposite of the moment. I’ve yet to hear a Hisaishi score I didn’t like, and this is one that fans should pick up, if they haven’t yet. Watching the flow of the characters on many unfinished backgrounds, put me in mind of another release from the previous year, the French animated film, Ernest and Celestine. Both are wonderful adaptations of some interesting source material, and the simplicity of their art is the kind of thing that I could see inspiring many to pick up a pencil. heck, I kept watching the flow of Kaguya’s hair, just admiring the line work. Every year, I always hope for one animated feature to rip my heart out, as well as find a film that is incredibly good, but that the general public will never really embrace. This year, I’m surprised (and happy) to say, that both of those distinctions, are melded into The Tale of Princess Kaguya. There’s probably another 500 words I could have put down about the film, but I had to stop myself. *Blogger’s note: Isao Takahata’s film “Only Yesterday” is not available in the United States.